Parks’ 3 Tots Gift Sets offer much more than the sum of their parts. 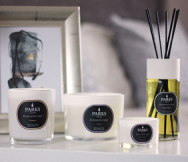 Each piece is specially crafted to present a combination of scents that create a wonderful atmosphere at home, in the office or any other place of work. Each is hand poured into a delicate glass votive mini vase, and will burn for up to eight hours of continuous use. Trimming is not necessary, because we only use premium smoke-free, soot-free cotton wicks. This set consists of three ‘tot’ size candles in our proprietary ‘Original’ citrus and vanilla scent combination. The citrus tones are distinct, tart and piquant, and lend the atmosphere a clear, pure feeling that is welcome nearly anywhere. When combined with vanilla – the scent of ice cream, baking and some of your favourite treats, it becomes a welcoming, relaxing fragrance that will soon become one of your favourites! Each tot burns for approximately eight hours of continuous use or more than a week if burned for an hour each day. Each has, at its core, one of our premium smokeless wicks, ensuring an even, soot-free flame that will never smoke or flicker. Around that is our proprietary blend of premium waxes, infused with the scents of pure citrus and 100% natural vanilla. The result is a powerful yet subtle scent which can last for years, remaining as fresh as the day they were poured. The Parks Original 3 Tots Gift Set will arrive in a presentation-quality gift box.